Meghan Markle to Become a Royal Auntie! Dolly Parton's First Children's Album Includes a Song Inspired by her Niece! Her Royal HighNiece Charlotte and Prince George Have Roles at Aunty's Wedding! Editor's Note: This is Melanie Notkin's debut article in Common Sense Media. Share "qual-auntie" time with nieces and nephews (or your own brood) by enjoying these classic movies with notable aunties. When my nephew was just 2 years old, I took him to see his very first movie in a movie theater. He was so mesmerized, he wouldn't sit down. He just stood there, completely engrossed in the wonder before him. A couple of years later, his little sisters joined us for their first movie in a theater. And as my life became more and more filled with more nieces and my nephew, I learned how to shield a child from the "scary part" of the movie, revel in singing out loud with my little nieces at the sing-along version of Disney's Frozen, and make sure the children have a special treat of their choosing to snack on. And after the movie, I gather the children, now including teens, to discuss the themes and lessons learned, encouraging each niece and nephew to offer their age-wise thoughts and perspectives. Watching a movie with my nephew and nieces, whether in the theater or at home, is one of my favorite auntie activities. Plus, kids always seem to remember who took them to see their favorite movie. I always feel lucky when it's one we saw together. We're not just creating memories, though. Research shows that the dedicated time an aunt spends with her nieces and nephews, what I've dubbed "qual-auntie time," helps develop their social, emotional, and cognitive skills. Co-watching movies offers aunts the opportunity to open discussions around the topics and issues the movies raise and help explain what the children may not understand. Plus, snuggling together at the movie theater, or on the couch, helps develop that ever-lasting bond between auntie and child. The special relationship between aunts and their nieces and nephews is so unique, I established Auntie's Day, a national day to honor and celebrate all the cool aunts, great-aunts, godmothers, and all women who love a child not-their-own. This Sunday, July 22, is the 10th annual Auntie's Day. If an aunt is fortunate enough to be with the children she loves this Sunday -- or any day -- a great idea for "qual-auntie time" together is an aunt-themed movie. 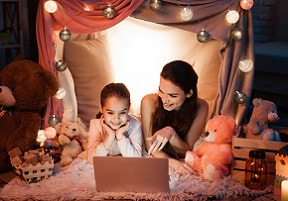 There are several movies for kids of all ages that feature an aunt figure, from the movies we loved as children to more recent movies aunties can discover with our nieces and nephews. Click here for my full article on Common Sense Media and discover find my favorites! Home Expertise Celebrate Auntie's Day with Movies About, Who Else? Aunts!